Located atop the 11th floor of the Grand Plaza Hotel Beachfront Resort & Conference Center, Level 11 has some of the most spectacular views of any restaurant on St Pete Beach. 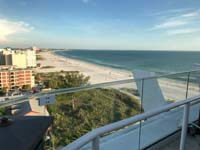 To the west and south you have panoramic views of St Pete Beach and the Gulf of Mexico. To the east, you gaze over expanses of the Intracoastal Waterway. Both views are equally spectacular. The restaurant is located on a rooftop extension one floor down from the popular, and more formal, Spinners restaurant. The cuisine is internationally inspired small plates, light fares, appetizers, and dishes that are meant to share with family and friends. The proteins include various forms of seafood, beef, pork, duck and chicken. The time we went the duck bacon potstickers and Caicos calamari were two of the standouts for us. The Charcuterie & Cheese Board was huge, and a nice plate for sharing. They also serve craft cocktails, sparkling specialties, martinis, wine, and an assortment of craft and domestic beers. 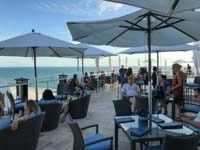 The Level 11 Rooftop Artisan Bistro Bar is located atop the Grand Plaza Hotel Beachfront Resort at 5250 Gulf Boulevard, St. Pete Beach, 33706. Interested in buying or selling a condo or home on St Pete Beach? Check out the latest listings in our St Pete Beach Condos or St Pete Beach Homes sections!